Aadhar Card Address Change: How to Change Address in Aadhar Card Online? How to Change Address & Other Data in Your Aadhaar Card Online? Aadhar Card Correction Online, Aadhar Card Update Status: How to Change Name, Address, Mobile Number or Date of Birth in Aadhaar Card Online or Offline? Aadhaar Card is now a very important ingredient of our life. Aadhaar Card plays a very vital role in almost every stage and can’t be ignored anywhere. India got lots of new things in recent few month. From Demonetisation to GST implementation, India still continues the treatment of Aadhaar Card in various sectors. Aadhaar card is now linked to all the important Government Documents or in other Sectors. So Government has also introduced a special Online Portal for taking care of individual Aadhaar Card which is named UIDAI. When Aadhaar Card was introduced, people started applying for their Aadhaar Cards in hurry and they ended up doing little minor mistakes which are pinching very hard now. Have you registered someone else’s Mobile Number on your Aadhaar Card? Is your Aadhaar Card showing only the Year of Birth instead of full Date of Birth? Do you want to Change your Address in Aadhaar Card? 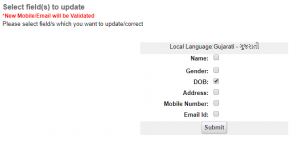 So How to Update or Change Data of Aadhaar Card Online? Aadhar Card Address Change or Aadhar Card Update or Aadhar Card Correction is possible Online or not? 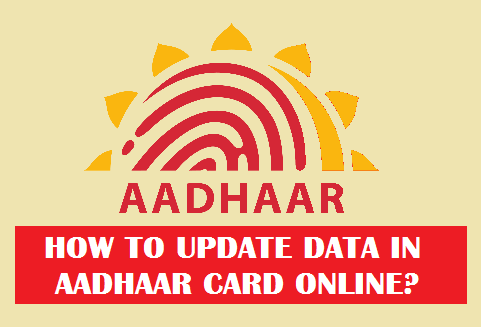 Yes, it’s easily possible using UIDAI Online Portal and here in this Guide, we will see How to Update Aadhar Card Online or How to Change Data of Aadhar Card Online. 1.2 How to Change Address in Aadhaar Card Online? 1.3 How to Update Mobile Number in Aadhar Card Online? 1.4 How to Change or Update Name in Aadhaar Card Online? 1.5 How to Update or Change Date of Birth in Aadhaar Card Online? 1.6 How to Check Aadhar Card Update Status Online? 1.7 How to Download e Aadhaar Card Online? UPDATE: Recently, UIDAI removed Aadhaar Card Mobile Number, Name, DOB Update Option. Currently, you can only do Aadhar Card Address Change Online through UIDAI Portal. Stay updated here for further updates. For Aadhar Link with Mobile Number through OTP: How to Link Aadhaar with Mobile Number Online through App or SMS? For Airtel, Jio, Telenor Users, Check this Guide: How to Link Aadhaar with Mobile Number? Before moving ahead, let’s first see the Basic or Primary Requirements for Updating or Changing any Details of your Aadhaar Card Online. Note: Documents Required varies on the basis of the Data you have to update. Let’s now proceed ahead with Updating Aadhaar Card Online. We will see step by step guide to do Aadhar Card Correction Online for every Data i.e., Name, Mobile Number, Address and Date of Birth. So let’s start. How to Change Address in Aadhaar Card Online? Note: To request Aadhar Card Address Update Online, you will need to submit any Address Proof such as Vehicle Registration Certificate, Water Bill or Electricity Bill, etc. for the Verification Purposes. Step – 2: Enter your Aadhaar Card Number and the Verification Text you see on the image. Then click on Send OTP button. Step – 3: You will receive OTP on your Aadhaar Registered Mobile Number. Just enter the OTP and click on Login button. Note: If your Aadhaar Card has no registered mobile number, then you won’t get OTP anywhere since Aadhar Card Correction Online without Mobile Number isn’t possible. In such case, you will need to visit Offline Aadhaar Kendra and get your Changes done there. Step – 4: On next page, select Address from the Options and click on Submit button. Step – 5: On next page, enter your Updated or Correct Address in English and the Portal will translate it to your Local Language. Just make sure, the Address you Enter is Correct in both the Languages. Once done, just Submit it. Step – 6: Now you will have to upload any Adress Proof like Vehicle Registration Certificate, Water Bill or Electricity Bill, etc for the Verification Purposes (check the options available for address proof document below). Just take the Scan (soft copy) of your Address Proof and Upload it and you will get the option to select Agency. Step – 7: You will have to select BPO Service Provider or Agency who can verify your Documents. Select the Agency and click on Submit button. Step – 8: That’s it. Your Aadhar Card Address Change or Correction Request is Registered. You will be given a URN (Update Request Number). Just make note of it or store it somewhere. In few days your Address will be updated in the Aadhar Card and you will get a new Aadhaaar Card via Post in few days (till the time, you can Download updated Aadhaar Card and use it). You can check the Status of your Update regularly using URN (Steps to Check Aadhar Card Update Status are added below). Note: Choose and Submit any one of the Documents from the list. NOTE: After Recent Updates, UIDAI Portal is no longer accepting Aadhaar Card Changes of Name, DOB and Mobile Number. So you won’t be able to change or update such data online as of now. So visit nearest offline Aadhaar Kendra if you need to update such details. Stay tuned here for further updates. Below guide was prepared at the time when UIDAI allowed to updated such data online. 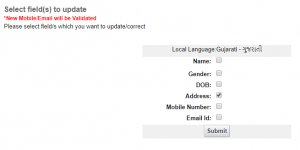 How to Update Mobile Number in Aadhar Card Online? How to register mobile number in aadhar card? How to add mobile number in aadhar card? 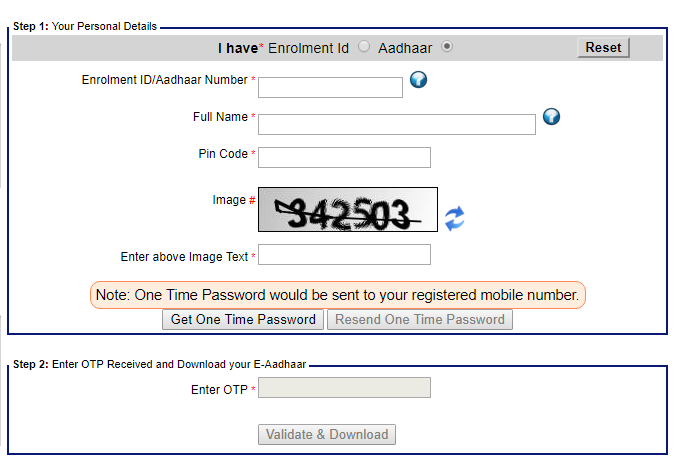 How to add mobile number in aadhar card online? What if I say you can do this Online just using your Smartphone or Computer?  Glad? So if you want to know How to change the Registered Mobile Number in your Aadhaar Card then just follow this Steps. Using this Guide, you will be able to Change or Update your Mobile Number in your Aadhaaar Card Online very easily. And well, you don’t require to Submit or Upload any Soft Copies of any Documents since you are just updating your Mobile Number. Note: Updating Mobile Number in Aadhaar Card Online doesn’t require any type of Document since you will be verifying your Mobile Number through OTP. Step – 4: On next page, select Mobile Number from the Options and click on Submit button. Step – 5: Enter the Mobile Number you want to Update or Replace with. You will be sent OTP on the updated mobile number. Just enter the OTP and submit it. Step – 6: That’s it. Your Aadhar Card Mobile Number Update Request is Registered. You will be given with a URN (Update Request Number). Just make note of it or store it somewhere. In few days (mostly in 2 days) your Mobile Number will be updated in the Aadhar Card. You can check the Status of your Update regularly using URN (Steps to Check Aadhar Card Update Status are added below). How to Change or Update Name in Aadhaar Card Online? Note: To change your Name in Aadhaar Card, you will need to submit an Identity Proof for the Verification Purposes. Step – 4: On next page, select Name from the Options and click on Submit button. 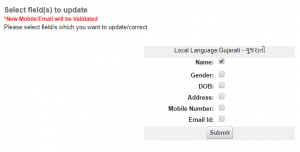 Step – 5: On next page, enter your Updated Name in English and your Local Language both and Submit it. Step – 6: Now you will have to upload Identity Proofs like Voter ID Card or PAN CARD or Driving License or Passport, etc (check the list of Identity Proofs below). Just take the Scan (soft copy) of your Identity Proof and Upload it and you will get the option to select Agency. Step – 8: That’s it. Your Name Correction in Aadhar card or Aadhar Card Name Correction Request is Registered. You will be given a URN (Update Request Number). Just make note of it or store it somewhere. In few days your Name will be updated in the Aadhar Card and you will get a new Aadhaaar Card via Post in few days (till the time, you can Download updated Aadhaar Card and use it). You can check the Status of your Update regularly using URN (Steps to Check Aadhar Card Update Status are added below). Hope this Guide on How to Change Name in Aadhar Card Online helps you enough. How to Update or Change Date of Birth in Aadhaar Card Online? Is your Aadhaar showing only the Year of Birth? Do you want to Change, Edit or Update full Date of Birth in your Aadhaar Card? Well, not to worry as you can request Aadhar card date of birth correction online very easily. Just follow the given steps to update or change the date of birth on your Aadhaar card online!! Step – 4: On next page, select DOB from the Options and click on Submit button. Step – 5: On next page, enter your Correct and Full Date of Birth and Submit it. Step – 6: Now you will have to upload any Date of Birth Proof Documents like Birth Certificate, SSLC Book/Certificate or Passport, etc. for the Verification Purposes (check the options available for DOB Proof document below). Just take the Scan (soft copy) of your Date of Birth Proof and Upload it and you will get the option to select Agency. Step – 8: That’s it. Your Aadhar Card Date of Birth Correction Request is Registered. You will be given a URN (Update Request Number). Just make note of it or store it somewhere. In few days your Date of Birth will be updated in the Aadhar Card and you will get a new Aadhaaar Card via Post in few days (till the time, you can Download updated Aadhaar Card and use it). You can check the Status of your Update regularly using URN (Steps to Check Aadhar Card Update Status are added below). So finally you now have step by step guide to Update main data of Aadhaaar Card i.e., Name, Address, Mobile Number and Date of Birth. Now let’s check How to see the Aadhar Card Update Status Online. So you have requested any data update in Aadhaar Card online through the Guide given above. You can check the Status of your Request Online itself and it’s really easy through the URN given to you while you Requested any change in the Aadhaar Card Online. Just follow the given steps to Track or Check Aadhar Card Update Status Online. Step – 2: Enter your Aadhaar Number and URN (Update Request Number) that you got when you requested for Data update in Aadhaar Card. Note: The URN you got will contain Numbers with Slashes(/) in between but while you Submit it to Check the Aadhar Update Status, you have to enter URN without Slashes i.e., you just have to type the Number as URN. Step – 3: Enter the Text you see in the image and click on Get Status button. Step – 4: That’s it. On the Next Page, you will see the Status of your Aadhaar Card Update. It can tell you when you request will proceed or when it will be completed. In case of failure of the request, you will be given the reasons and tips to submit the correct request. So this was the easiest way to check the Aadhar Card Update Status Online. After Aadhar Card Update Status Enquiry, you can get to know the details of your request that you submitted. If your request is Successful and Aadhar Card is Updated, the new Aadhaar Card will be posted to your Residential Address within 1-3 months. Since it may take few days for the Original Aadhaar Card to arrive at your home, you may use e-Aadhaar Card for that time. e-Aadhaar Card means a Soft Copy of your Aadhaar Card or Downloaded Aadhaar Card which you can store on your Phone or Computer. You can carry it along with you and use it. So How to Download e-Aadhaar Card? Let’s see. Enter your Full Name given on your Aadhaar Card. Enter your PIN Code according to Aadhaar Card. 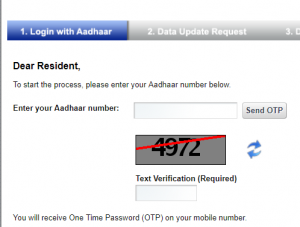 Step – 3: You will receive OTP on your Aadhaar Card Registered Mobile Number. Just enter it in the OTP field and click on Validate & Download button. Step – 4: That’s it. e Aadhar Card Download will Start. Once downloaded, click and open e Aadhaar Card. Step – 5: The e-Aadhaar Card file is Password Protected. So What is the Password to Open e Aadhaar Card? Well, Password is your Postal Code i.e., Your Area PIN Code according to Aadhaar Card. Just enter PIN Code as Password and the file will now open. You can see your Latest Aadhaar Card but this is e Aadhaar Card, a Downloaded Aadhaar Card. You can store this on your Phone and Computer until you receive the Real Updated Aadhaar Card through Post from UIDAI. Now let’s see a Frequently Asked Question regarding Aadhar Card Update Online. Question: Is Aadhar Card Correction Online without Mobile Number Possible? Answer: No, it’s not possible to do Aadhar card correction online without mobile number since, through Online Aadhar Card Update, your Identity has to be verified instantly right at the time. The only instant verification available is through Mobile Number Verification. If your Aadhar Card isn’t registered or any mobile number isn’t linked to your Aadhar Card then you won’t be able to do OTP verification online. Hence, Aadhar card correction online without a mobile number isn’t possible. Address in Aadhaar Card can be changed/updated online and the guide for the same is mentioned above. Click Here to check the valid Address Proofs available to change or update the address in Aadhaar card. Whenever I write my address in english it automatically transliterate in to my regional language i.e bengali. But it transliterating it wrongly. How can I make it right? Click on the Words you see in your regional language and you can edit it there itself. If you are not able to type in your regional language then first google for any regional keyboard or editor or even you can try Google’s English to any other language converter. Make your full address in your language using such tools and then paste it in UIDAI Portal! 😉 Hope this helps. I have tried that but pasting doesn’t work there. Umm. In that case, you will have to type in English in such a way that UIDAI translator translates correctly in your regional language. You can not change your Photo in Aadhaar Card Online. You will need to visit nearest Aadhaar Centre or Kendra and request Photo update/change. images are old one, as no such mobile number update is not possible. Only address can be changed. So, u must double check and post it in your website. Very sorry for this. Recent update, they have removed an option to change name, mobile number and other data. Now only address can be changed online. very easy and detailed guide for Adhaar card correction, all the info we can get in a single post. 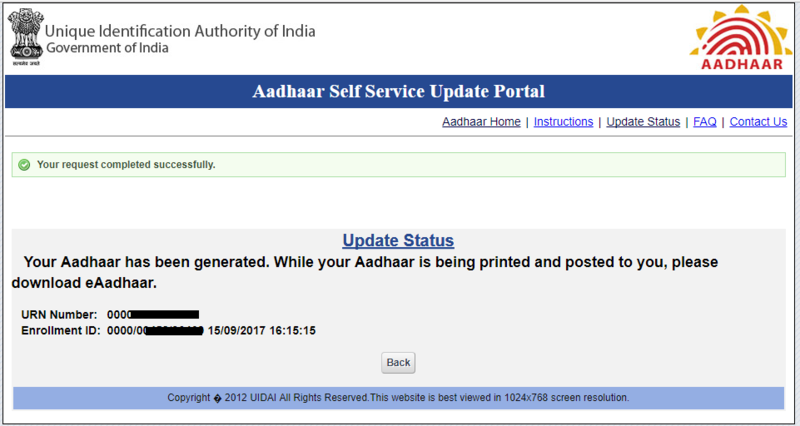 it’s not a spam post its a detailed and step by step guide for adhaar card update. its looking like spam post. Why do you think so? Isn’t it informative and helpful?